The second exercise of Ironhack’s UX/UI prework bootcamp is a design thinking exercise. 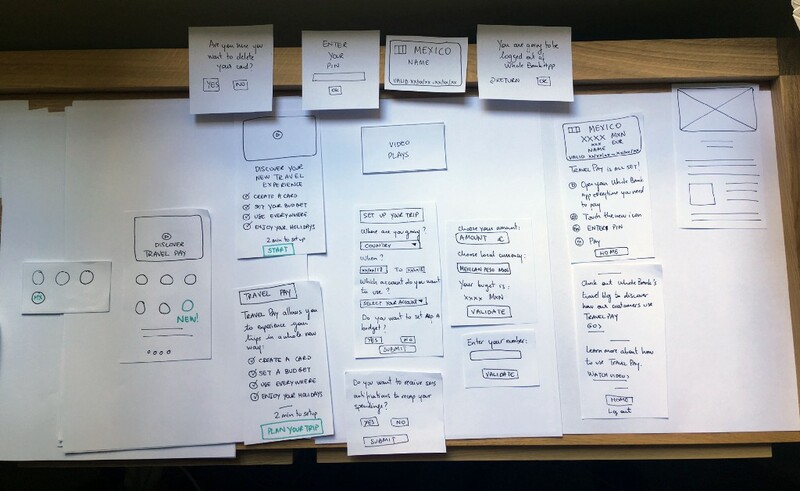 Students have to design a mobile payment solution for traveling customers of a (fake) bank. Let me first say this: I would love to join a bank or a fintech after Ironhack’s bootcamp (hello employers!). I worked with the digital marketing team of the National Bank of Canada in Montreal for almost 2 years and I discovered UX there — I worked with UX designers and I first-hand saw how effective UX was to redesign sections of the bank’s official website. I find it very interesting how people relate and behave with money and let’s be honest, banks have a lot of work to do to provide better service to their customers. Also, I have a master’s in Finance and it’s about time I made a good use of it. This case is a very good learning opportunity for me to test my abilities so I’ve tried to add as many resources as I saw fit to explain my process. The case is long and I have to respect guidelines given by the school for completing the exercise so here are quick links to every section. Brief summary of the case: Identifying what the client wants. Design thinking Step 1: Empathize and discover how my sample of users behaves when it comes to finance, traveling and technology. 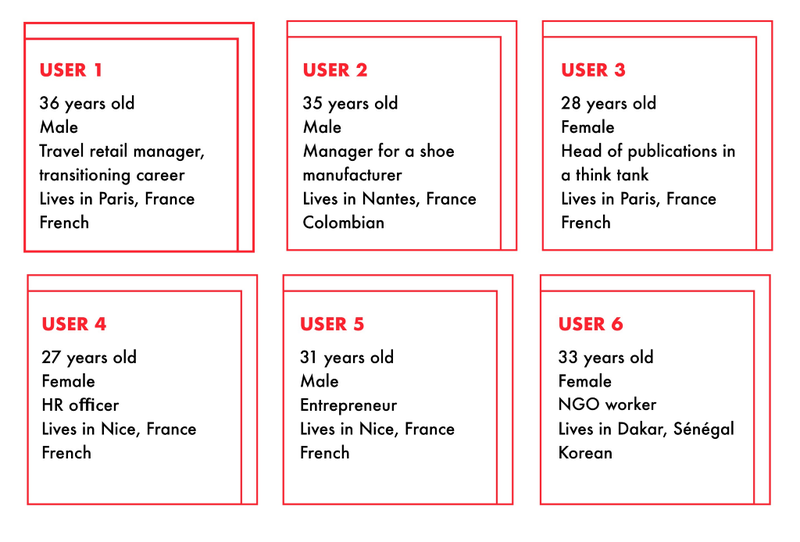 Design thinking Step 2: Define and reframe the case’s problem in line with users’ needs. Design thinking Step 3: Ideate and discover how I designed my solution. Design thinking Step 4: Prototype and learn about my solution, Travel Pay by Whole Bank. Design thinking Step 5: Test it! I made a live prototype. Note: The case is written for an American audience. I live in Paris, France and will attend Ironhack’s UX/UI bootcamp in Paris so my user research is focused on French and francophone users. The debit/credit system works differently in France than it does in the US. Whole Bank has clearly stated its problem and the solution that it is looking at developing is straightforward: replace a physical card by a feature in Whole Bank’s app. 4/ users’ habits when they travel. I added a “What if…?” question at the end of the interview as a means to open the conversation and get a deeper insight into the users’ needs. I interviewed 6 people: 3 women, 3 men. Interviews lasted between 40 min and 1 hour. Half of the interview were done on the phone while the other half was done in person. I chose to focus on age group 25–35. Users all use their banking apps regularly. They feel like all their needs are addressed by the app and are satisfied by their experience. Users predominantly use only 2 apps to fulfill their banking and payment needs: their banking app and a money-sharing app. Two of them use third party service (Payl Pal) for regular transactions and they do so for security reasons. Users are mostly content with their financial habits and few of them have expressed concern when using a credit card abroad. They have been vocal about two concerns: using their credit card in well-know establishment and not being able to pay with their card (in the US, Canada and Mexico). All of the users use their credit card a lot at home and while traveling. About two-thirds of payments are made with credit cards by most users. Users are all enthusiast about using wireless credit card (paiement sans contact) but only half of them would like the payment ceiling to be higher. They highly enjoy the experience because it is simple, fast and reliable. Most of the users use a money-sharing app like Lydia, although most of them do not use them regularly. All of them have started using these apps after friends recommended them. With wireless credit card, it is the only new financial habit that most of the users have acquired in recent years. None of the users use mobile payment. None of the users consider themselves early-adopters with money-related technology. They are heavily influenced by friends and recommendations and online reviews of products when they adopt new habits. Very few users have had a bad experience abroad with their credit card. The main user problems I identified were not exactly bank-related, or credit card related as most of them feel satisfied with their current experience. User are frustrated when technology doesn’t work and doesn’t allow them to do what they want. They don’t like waiting for things and when technology slows them down. While users have general concerns about their data and sharing data, they are not anxious about the security provided by their bank but they are very reluctant to share their information with a third party such as Apple Pay or Android Pay. While they are not overtly interested in testing mobile payment services, they would be more open to it if mobile payment was offered by shops more frequently and more broadly. Some users feel like there is an information gap with their bank. Some of the users feel like they don’t have have enough information from the bank (information about their services or fees for instance) and some would like advice on how to better manage their money. Users find banking fees when using their card abroad too expensive. They all understand why they have to pay these fees but would like to pay less. On the one hand, Whole Bank wants to provide its customers with a « payment feature that they can use exclusively when they travel, so instead of using their cards, they can use the app on their mobile devices (extract from the case document) ». 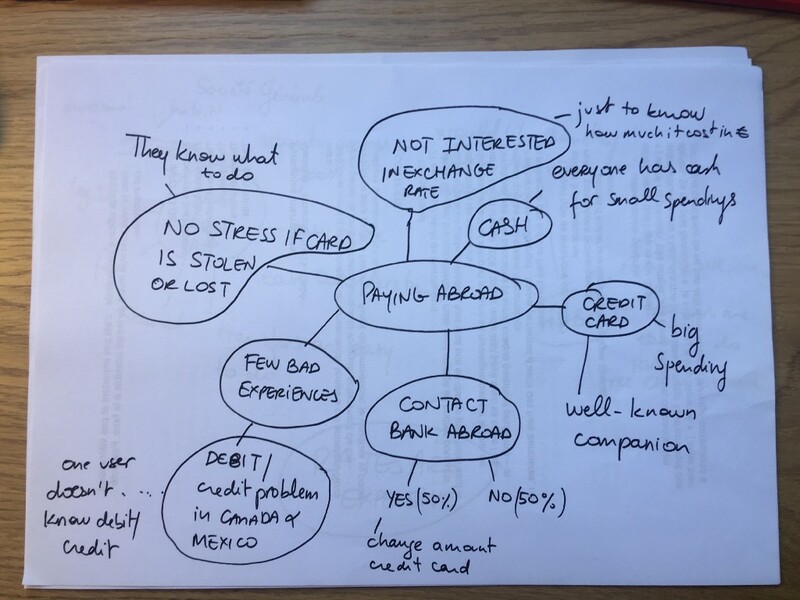 On the other other, my (limited) user research shows that customers are satisfied with their experience when traveling and have never experienced major issues with their credit card abroad. In addition, the users I interviewed show a limited interest in mobile payment and dismiss it because it is not wildly used in France. They are also very attached to their credit card. 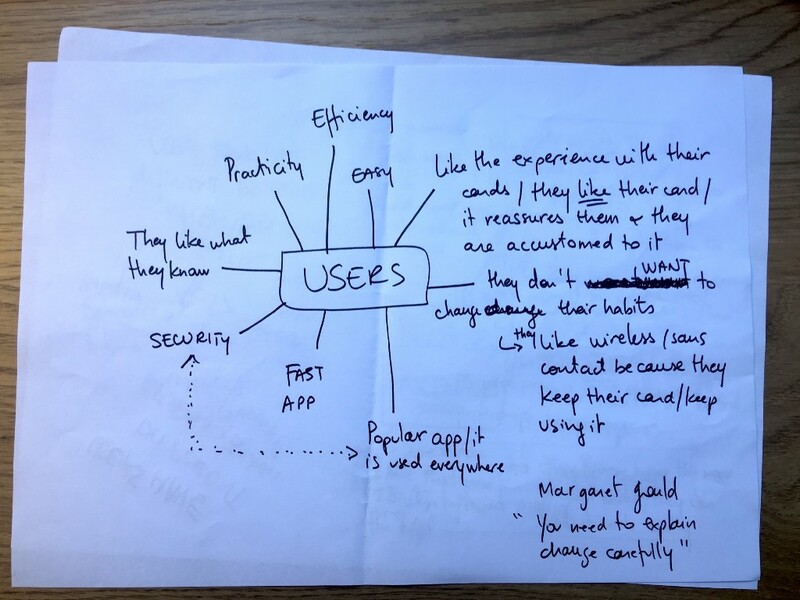 1/ Most users I interviewed trust their bank and regularly use their bank application. They have a habit of using their apps and enjoy the experience or find it useful. 2/ Users enjoy wireless (sans contact) payment. They have adopted very quickly the habit of using this technology, despite their concern about security. So while they are still using their card, they are also adopting new payment habits. The starting point of the case was « how can Whole Bank improve the payment for traveling customers ? » and the initial solution was « by providing a feature in the app that travelers can use to replace their card ». The research shows that users are not interested in replacing their card but they are interested in interacting with their app. I think that the problem should be reframed into « how can Whole Bank improve its application and provide added value for his traveling customer »? I think we should refrain of wording the solution as a « replacement » for the card because users are attached to their card: they still use it in their daily life so it will be difficult to make them change their habit while traveling. Instead of thinking about the new feature as a «no card while traveling » service, I think we should think about it as a « your bank offers you a new travel experience » service. While synthesizing my interview notes, I started making mind maps about the common features that appeared in the interviews. I’m not sure if mind maps should be used this way but it was useful to visualize the info in clusters of information and it helped me identify the must-have elements the new service Whole Bank should offer. I’ll only share a few of my notes as I don’t want to overcrowd this article with information. I found 3 possible solutions and included a 4th one that looked like Apple Pay as a reminder that I needed to connect the user’s experience with their physical credit card to their experience using the application. I chose to develop the last solution (“set your budget solution”) because most users I interviewed set a budget for the trips: they either loosely set a budget in their minds, they made a paper budget, or they knew from prior trips how much they were willing to spend. I thought it could be more useful to them to actually set a budget on their phone because they already have this habit. I thought that the card image could also feel like the user is putting money on a new card, which might help connect the user’s usual credit card experience to this new one. I named the solution Travel Pay as it was easier for me to think about it if it had a name. Travel Pay allows users to set up a dedicated mobile payment solution for each of their trip. they can decide if they want to receive sms notifications during the trip about their spendings. After doing this, a Travel pay card will be set up for the trip and only valid during the trip. If users chose to set a budget, Travel pay card will stop working when the budget has been spent. Users can modify or delete their Travel pay card anytime before or during the trip. I made a map to explain how it works and you can see the paper prototype below. User map. I’m not sure how to make these but I wanted to explain what I want the user to do on each screen. The solution aims at cloning users behaviors without changing their habits too much (remember, they like their credit cards). It should provide a WOW effect when users start using it in order to make them come back. I think there would also be a lot of work to do on the branding aspect of the solution and show users how the solution works anywher and facilitates their payment abroad. I made very simplified live prototype to send to my user sample and ask them what they think about the solution I designed. I am waiting for the results as I publish this post and will update this section when all the users will have given me their feedback. You can try the solution here. You can click on the screens to reveal click areas. This process is a lot of work and I find that writing about the results of the research is also very challenging. I don’t like when things are not clear so I tend to over-explain everything. Writing makes things permanent and this process is about iteration so it’s hard to reconcile both aspects of the exercise. Users actually give you many, many, many insights: it’s amazing how people behave and react differently when interacting with an app and how they are able to explain it well. Design thinking is a hands-on approach: I didn’t really understood how it worked before doing the exercise and I find it way more dynamic then what I thought it would be. However, I feel like one needs a really good methodology to exploit the data collected in the interviews — I’m guessing this is were practice comes in place (the more you practice, the better you get at it). Synthesizing the information is hard and I would love to have a better methodology to do it. I had data for only 6 interviews and it was quite a challenge to synthesize the information. I am very curious to know how it works in practice when one has a lot more data to work with. While some tasks in the process are fine to work on alone, I felt I was missing someone else’s opinion or feedback, especially in the ideation phase. It’s hard to brainstorm with yourself! Like I mentioned at the beginning of the post, I worked for the digital marketing team of the National Bank of Canada. While ideating and designing the solution, I felt like I was thinking too much about the marketing aspects of the solution (“how do you introduce change”, as Margaret Gould Stewart said in her speech) and about the technical constraints of my solution. To wrap up, I liked the exercise but it would have been easier to make a presentation or a video about the results and work in a team. Let me know what you think! I’m curious about learning how this process works in real life. Would you use Travel Pay if your bank offered the service? P.S. : Bankers and fintechs: I would love to work for you! Learning by prototyping was originally published in Prototypr on Medium, where people are continuing the conversation by highlighting and responding to this story.